It has been said that the clumsy swaying gait of the penguin helps them conserve energy and is caused by their short little legs. Elegant?…No. But entertaining?…YES. Waddling around from shore to shore the short-legged, lighthearted creatures of Argentina create a sight-seeing buzz and a hilarious spectacle. There is no better way to get a glimpse into the life of a PENGUIN than by walking amidst their amusing communities, and we are going to tell you exactly how to do so. If you are going to venture to Ushaia, aka “The End of the World”, you better expect to have some unique experiences. At the southern tip of Argentina penguins roam the lands of Tierra del Fuego. While there you can’t forget to book a couple of boat charter trips to see the beautiful surroundings and wildlife. One such trip will lead you to the Penguinero where you will find…penguins. (Big surprise, I know). The views are highlighted by the wide open sea, the mountains, and the talented penguins. You may not see them singing or dancing as you may have envisioned after watching the Happy Feet Warner Brothers movie debut, but they will show you tricks of other sorts that will be equally captivating. The Catamaran trip as well as the Motonave Barracuda sail trip will both take you around the Beagle and provide front row tickets to the penguin show. Any sensible person will tell you that the journey to these southern lands are well worth the trip; however, if you can’t quite make it to this hard-to-reach destination you will be happy to know that your luck hasn’t run out before your time or money. 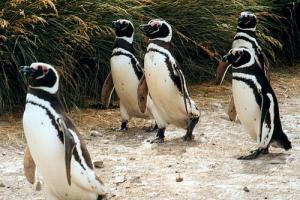 1380 Km south of Buenos Aires is the town of Puerto Madryn – another location where the penguins like to camp out. 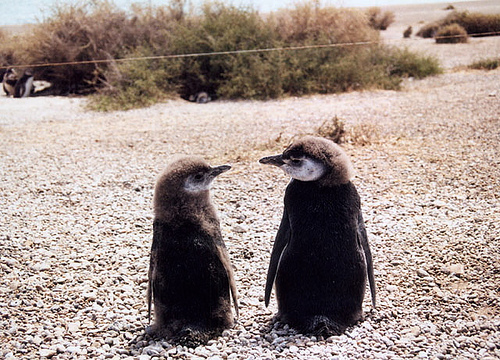 Just south of Puerto Madryn is one of the most important breeding colonies for Magellanic penguins on the continent. Punta Tombo is the name of the penguin colony that lies on the eastern shores of Argentina. Full day tours are offered from Puerto Madryn with numerous travel agencies in town. However, the tour involves a three hour bus tour down a boring dirt road that would be much more enjoyable in a rental car with a ground of friends. Both options are available, but a ride in a rental car has a more appealing ring to it. Punta Tombo is home of hundreds, or even thousands (if you arrive in high season), of penguins that waddle around their community, interact with their visitors, and put on all kinds of water shows. Visitors can easily mingle with the little creatures while snapping some great up-close-and-personal shots to send home to the family. But make sure to maintain an arms length distance or you may get snipped! If you are interested in learning more about the lives of the penguins there are also signs posted all throughout the penguin viewing paths of Punta Tombo that provide background information on these perplexing creatures. Their life cycle, the role of the males and females, and what they do for food, are all topics that can be learned while walking around. At the end of the day you will be much more educated on their lives and existence. Last, but definitely not least, are the penguin seeing opportunities on Peninsula Valdes. Peninsula Valdes tours also begin from Puerto Madryn and involve a full day tour of the flora and fauna of this protected reserve. Wildlife is abundant on the tour and includes whales, sea lions, seals, guanacos, orcas, maras, and even the penguins. You won’t find a big colony of waddlers on this tour like you see at Punta Tombo but there will be some around to improve your sight-seeing adventures. The unique mannerisms and carefree nature of the penguins are very intriguing and contagious. Regardless of where you go to have your penguin experience, you will surely break out in laughter a time or two before the trip is over, and you will have great insight into the life of a penguin. For more information regarding tours to Punta Tombo and Peninsula Valdes, contact any of the travel agencies listed below. Or if you prefer to car rental recommendation, here are a few car rental companies as well. This page rendered in 0.656 seconds.